In this tutorial we have made it very easy for you to start a business of selling websites online and offline. Every online business start with a domain name so first of all register a domain name for your website. Step-1 Register a domain name. Purchase a domain name for your website. Why? This is your online address where your customers will find you in future. How it works? You tell system@sangkrit.net the basics on your website via an email interview. After reviewing all your information the system at SANGKRIT.net creates a website based on your instructions. Hosting Cost: This is all your profit. It entirely depends on you how much you charge your customers for hosting their website on your ultimate hosting plan. Every time you sell a new website, hosting cost becomes all yours because one ultimate hosting is enough to host unlimited number of domains and websites. This time register a domain name for your client and email System@SANGKRIT.net to get your client’s website made. Step-8 Find more customers and repeat the process from step-5 to step-7. 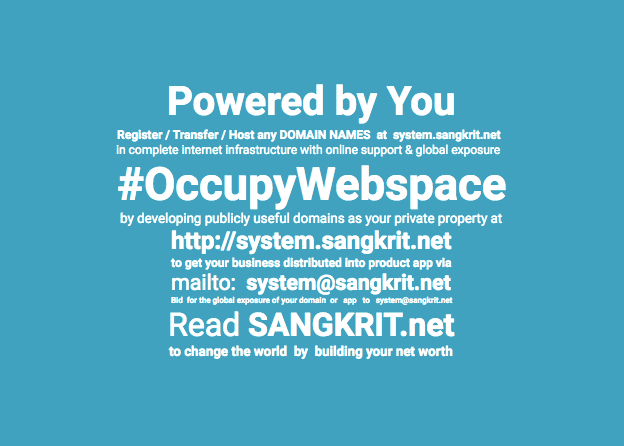 Find more customer, register their domains and get their website made by system@sangkrit.net.